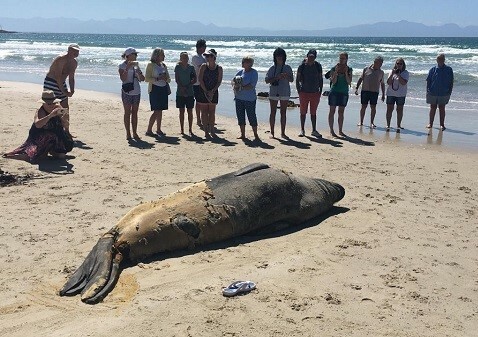 The City of Cape Town and the National Department of Environmental Affairs (DEA) would like to remind the public of the elephant seal moulting period which is currently under way. Fish Hoek beachgoers can expect to see the seal ashore for a few more weeks. A moult is a process by which the elephant seal sheds all of its pelage and underlying epidermis. This annual process can take up to a month to complete. During the moult, the elephant seal remains on land as the process of moulting renders them sensitive to changing temperatures therefore they avoid the water. During this period, the seal generally does not feed either as it is able to sustain itself through its blubber (fat reserve). The City and DEA requests that the public respect the elephant seal during this period and stay at least 10 metres away when viewing and photographing him. Tape has been put up to demarcate the area and residents are to please abide by this. ‘We urge that parents also ensure that their children are kept under close supervision and don’t go within 10 m of the animal. Beachgoers who plan to walk their dogs should keep them on a leash at all times within 50 m of the animal. We ask that you please do not attempt to feed the seal, throw water on it or create any other unnecessary disturbance within close proximity to the animal. ‘In particular, taking selfies with your back turned to the animal and within close proximity is strictly prohibited. These seals can also move deceptively fast when on the beach and are extremely dangerous when they feel uneasy or cornered. While this particular seal seems to be relaxed, please note that it is a wild animal that can inflict a serious bite and its behaviour is unpredictable.’ said the City’s Mayoral Committee Member for Spatial Planning and Environment, Alderman Marian Nieuwoudt. The City, in partnership with the Shark Spotters, has decided to station one of the Shark spotters at the seal for the remainder of the time that he is on the shore to ensure that he is not interfered with. Members of the public are encouraged to please give the seal space until it is ready to go back out to sea and to listen to the Shark Spotter’s instruction.